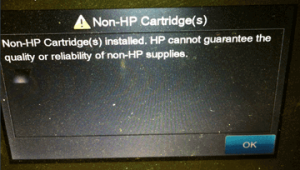 NOTE 1: “Empty” and “Low Ink” alerts are COMPLETELY NORMAL for all HP 60 or HP 61 ink cartridges which have been refilled! While at first this may be an unusual workflow, it does allow print operations to proceed. NOTE 2: If a “Non-HP Cartridge(s)” message, or similar message, cannot be bypassed then the cartridge may be suffering from marginal internal electrical performance and may need to be replaced with a new one. First remove and thoroughly clean cartridges electrical contacts & printer flex cable contacts and retest (refer to Printer Maintenance). If the problem persists then return cartridge to your refiller for analysis. NOTE 3: You may not ‘Cancel’ (X) the alignment page until you press “OK” to start alignment. You may then cancel the alignment just prior to when actual scanning occurs; printer will default to the previously stored scanned settings. If the alignment page still fails to print then the cartridge may have an internal performance issue, confirm ink cartridge’s electrical health by selecting your printer model under ‘Solve My Problem’ above. Refer to ‘Cartridge Health Diagnostics’ (i.e. ‘Tap 41’) video for your printer model.